Keene’s AV gear always tends to be of a high standard and pleasingly the Keene SCART Commander is no exception to this. 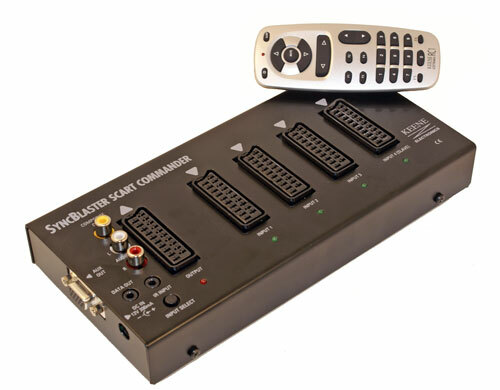 The Keene SCART Commander is packed with advanced features yet still comes in a small footprint. The SCART Commander is an automatic switch, but for those troublesome consoles there’s a remote that offers a full manual override. If you want to hide the switch away somewhere behind your TV, the remote control receiver thoughtfully comes on an extension wire, allowing the switch itself to be tucked anywhere while the IR receiver can peek out at the front. If four SCART sockets aren’t enough for you, it’s possible to daisy chain two SCART Commanders together and control them from the same remote. There’s even a RGBHV output and support for switching 31khz signals (pins 10 and 12 on the SCART plug are used for horizontal and vertical sync). Conclusion – A high quality, robust and versatile product. Just before they were discontinued, Keene were selling theb for around £50 each. At that price they were excellent value for money. If you find one on eBay for under £50 you are highly recommended to snap it up. As close to perfect as you're likely to see in a SCART switch.